News by Matt S. & Lindsay M.
Way of the Samurai 3 was developed by Acquire and originally released in 2008 for the PlayStation 3 in Japan. It came to Europe and North America 11 months later, and was available on the Xbox 360 as well as the PlayStation 3. In the game, a fictional land named Amana is ruled by a rising lord who overthrew his superior to become ruler. The civilians in Amana become overworked and overtaxed, leading to feelings of animosity directed to their new leader. The player (or you, dear reader!) takes on the role as a nameless character, created by piecing together heads and bodies. 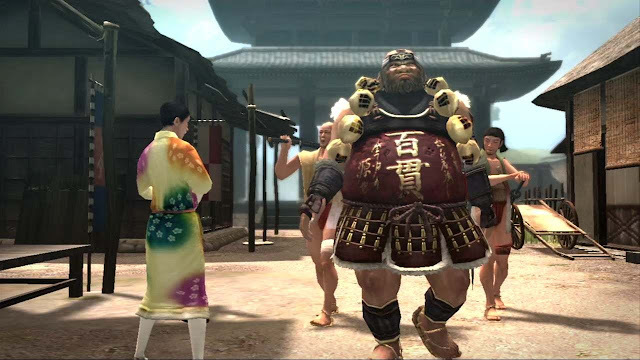 Way of the Samurai 3 is action-driven, so you are often left to select dialogue and actions. Interestingly enough, you can actually draw your weapon during any cut scene. An end-game title is given based on how well your samurai performs, as are Samurai Points that unlock heads, clothes, abilities, and secrets. Players are actually (refreshingly) encouraged to be honourable and Samurai Points will be deducted for those acts not quite so kind. Combat is melee-focused, with over 100 weapons available including said swords as well as spears and joke weapons (including a fish, whoop!). Blacksmiths can increase a sword's value and stats, and can also piece together new weapons from found parts. Each player also has a partner (there are over a dozen available) who acts like an NPC that can tag along through your quest. Some jobs actually require two characters to complete, not to mention partners bring in new abilities, so partners can be incredibly valuable assets. If this sounds good to you, then we've got even better news. Though we don't have a firm release date just yet, Ghostlight promises that work on the port is nearly done, so we can expect it soon. Get ready for one of the most surreal, and funny, open world games you'll ever play. - Matt S. & Lindsay M.